The Route 66 Sprint Series made a return trip to the uncharacteristic US Air Motorsports Raceway for the second stop of the 2016 program. The Shawano, Wisconsin facility is among the most unique and challenging karting circuits in North America, if not the world, at 1.1-mile long with multiple elevation changes. Now into its 16th season, the Route 66 Sprint Series hosted rounds three and four of the championship chase, surviving heavy thunderstorms Friday evening following all-day practice. Qualifying, Prefinal and Final events took part on both Saturday and Sunday under sunny blue skies and warm temperatures, all while the nine categories continued the shape the title contenders for 2016. Dakota Pesek continued his streak in the RLV Yamaha Senior category, extending his win total to four with another double win weekend. It was a near weekend sweep with Alexander Kardashian the only driver of the 26-kart field to beat Pesek in one of the six on-track sessions. Kardashian edged out Dakota in Saturday qualifying by just 13 thousandths of a second with a 1:06.355-lap. The two battled in the Prefinal with Kardashian slipping back toward the end and Pesek earning the win. Adam Crepin stepped up as a challenger in the Final, leading toward the end before Pesek assumed the position and held on at the line by 98 thousandths of a second. Kardashian drove to third over Eric Bartsch and Killian Keaveny. Pesek went perfect on Sunday, leading from qualifying to all eight laps of the Prefinal and the 12 laps of the Final. Crepin kept the pressure on all day, placing a close second. Keaveny joined them on the podium with Kardashian fourth and Emily Hurlbert in fifth. The other headline category was a sweep as well with Josh Hotz earning his first and second career victories in the Merlin Racing Karts IAME Senior division. Double New Castle winner TJ Koyen set the pace in qualifying on Saturday, with Hotz showing the race pace. Josh took the Prefinal win before he drove to a seven-tenths advantage in the Final for his first career victory. Cavkusic joined the top two on the podium in third with Adam Crepin and Kindra Hurlbert rounding out the top-five. Sunday began very similar with Koyen quickest in qualifying once again. Hotz stepped up the pace during wheel-to-wheel action, working past Koyen for the Prefinal win. Leading all 12 laps of the Final, Hotz took his second victory of the weekend with Koyen only eight hundredths back in second. Cavkusic was third once again with Hurlbert up to fourth and Matt Stagl placing fifth. 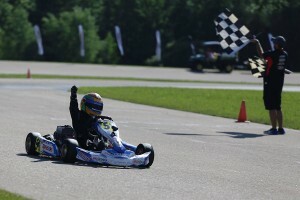 Elliot Cox was the big winner of the weekend, recording three victories in the Rookie level. Cox swept both rounds of the Williams Racing Engines Yamaha Rookie category. Saturday was a 14-second advantage over Kasey Williams with Trevor Johnson placing third. Elliot remained at the front of the field all day on Sunday, capped off with a nine-second margin of victory in the Final ahead of Pierce Sonderup and Williams. 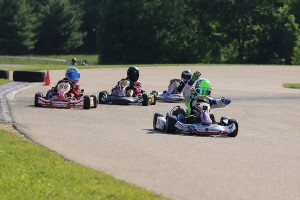 The Express Karts & Parts IAME Swift Rookie class was Cox’s third victory of the weekend. Saturday round of racing was all Elliot, sweeping the day with a six-second victory in the Final. Hunter Pruitt and Ryker Mattes joined him on the podium. Mattes picked up the pace Sunday morning, beating the field for the fast lap in qualifying. Cox fought back to win the Prefinal over Mattes with Evan Zarbo a close third. Contact on lap three of the 12-lap Final put Cox and Mattes on the sidelines, allowing Zarbo to drive away with the victory. Hunter Pruitt crossed the line third but was penalized for contact with Dane Sensel. They swapped positions for the podium, putting Sensel second and Pruitt third. The Woltjer Racing Engines Yamaha Junior class saw another double winner, this time with Matthew Northrup taking both checkered flags. Saturday was a perfect score with fast time in qualifying, Prefinal win, and fast lap in the main event en route to the victory by five seconds. Kyle Janssen beat out Aidan Harrington for second with Stephen Dial and Vince Scatena completing the top-five. Northrup was unable to make a lap in qualifying to begin Sunday, as Michael Paterno set the fast time. He and Aidan Harrington fought for the top spot until a charging Northrup came back to challenge. Starting last in the 20-kart field, Matthew was up to 10th by the end of lap one, and secured the Prefinal win with a last lap pass over Paterno. Northrup then drove away to lead all 12 laps for a four-second margin of victory in the Final. Harrington edged out Dial for the runner-up position while Janssen pushed Paterno back to fifth by the checkered flag. 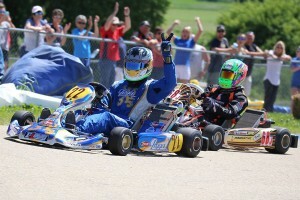 Maks Kowlaski and Stephen Dial split the victories in the Kart Craft IAME Junior class. Kowlaski led all day Saturday, sweeping the action toward his first victory of the season. Maks beat out Dial and Jacob Abel. Sunday began with Kowlaski continuing to show the way, posting fast time in qualifying and winning the Prefinal. Dial took over the point on lap two of the Final, and led the remainder of the way for his third victory of the season. Kowalski settled for second with Blake Weiss completing the podium. The Cadet divisions were among the most competitive all weekend with a number of drivers in contention and four different names completing the main events as the winner. Allison Racing Engines IAME Swift Cadet class welcomed two drivers to the list of victors in the new class for the series. Double New Castle winner Kaden Wharff set the pace in Saturday qualifying before Kyle Thome charged through for the Prefinal win. The two continued the battle into the main event, with Caleb Bacon, Taylor Maas and Nicholas Terlecki joining in. Contact on lap 11 dropped Wharff and Thome to the tail of the field. This put Maas at the point until Bacon took over the top spot on the final circuit, crossing the checkered flag for his first series victory. Terlecki slipped past Maas for second with James Lynch and Leandro Juncos completing the top-five. Thome had things in control Sunday, sweeping the day. Kyle drove to a two-second victory for his first of the year. Maas beat out Wharff for the runner-up position with Terlecki fourth and Keegan Bosch fifth. 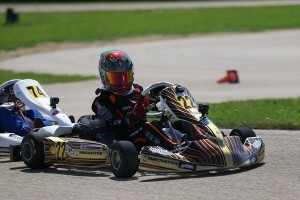 Kaden Wharff nearly completed a sweep in the Switch Racing Engines Yamaha Cadet division. Wharff dominated Saturday’s proceedings leading from qualifying to the final checkered flag for his second victory of the season. Kyle Thome was seven seconds back, beating Taylor Maas for the second position on the podium. Lucas Smalec and James Lynch rounded out the top-five. The field closed up on Sunday, with Wharff still leading in qualifying and the Prefinal. The Final was a battle, and Wharff used a last lap pass to cross the line first. Following tech inspection, Wharff was removed from the results for an issue with his can muffler, handing the win to Maas. Lynch was promoted to second with Bacon rounding out the podium. JJ Hansen was fourth and Parker Abed in fifth. 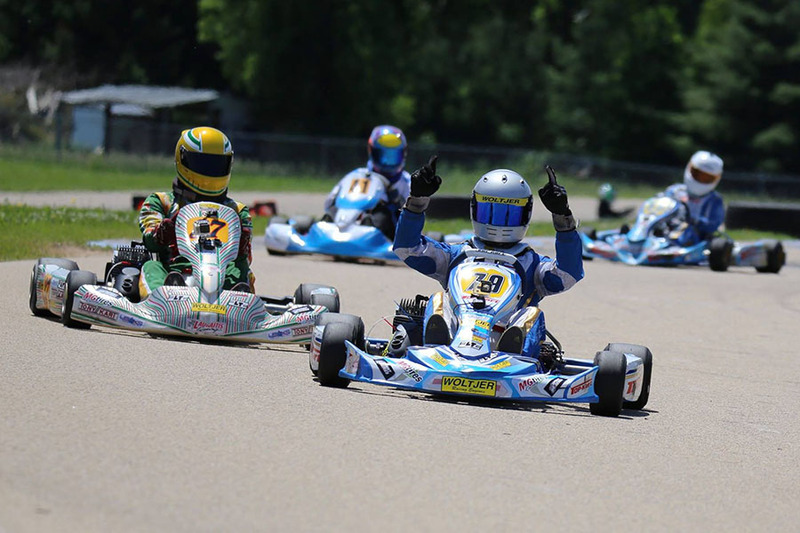 Indy Ragan nearly had two wins on the weekend in the Hollywood Crane Service Kid Kart, leaving with just one as Cameron Brinkman took the other. Ragan was the dominant driver on Saturday, posting fast time in qualifying and winning the Prefinal. An issue prior to the main event forced Indy to watch from the sidelines as Brinkman drove to a three-second victory. Austin Olds and Dane Van Dyck joined him on the podium. Ragan bounced back Sunday, leading all on-track sessions for the second victory of the season. Sean Dixon improved to second on the day, beating out Saturday winner Brinkman. The third event of the 2016 Route 66 Sprint Series take the program back to the Michiana Raceway Park in New Liberty, Indiana on July 29-31. Online registration is currently open. Please visit them online at route66kartracing.com and follow them on Facebook or contact Mark Coats via email mcoats.uspks@gmail.com.